Brave Rooney and The Super-Sized Superheroes tells the story of Rooney, a young child who goes to school with superheroes. As the only student who doesn’t have superpowers of his own, Rooney feels left out during recess and other fun activities. The only activity Rooney is invited to participate in is the “Super Planetary Pig-Out,” which is when all of the students and staff try to eat as much food as they can in as little time as possible. Rooney chooses not to participate in this activity, though, and as time goes on his classmates become heavier and heavier. 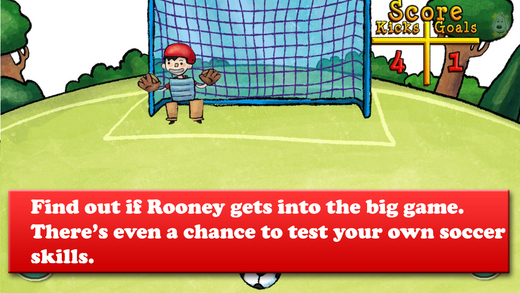 Eventually they’re unable to play their favorite game, soccer, and it’s up to Rooney to save the game. Rooney helps teach his classmates about healthy eating habits, and eventually everyone is back to normal. Not only is the story of Brave Rooney and The Super-Sized Superheroes a great one, but the app is incredibly interactive and filled with animations, sound effects, and music. Pretty much everything on the page is responsive to touch, and kids are highly encouraged to explore each page. 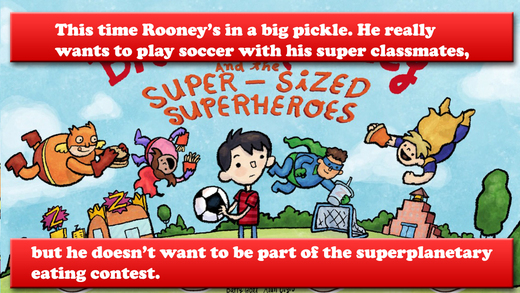 Brave Rooney and The Super-Sized Superheroes features two different reading modes, as well. The story can be read aloud (narrated) via the “Read to Me” option or read alone. Parents can even fine-tune the reading experience further via the comprehensive settings menu. Regarding narration, I found it to be incredibly clear and easy to understand. Parents will be happy to know that Brave Rooney and The Super-Sized Superheroes doesn’t include in-app purchases or ads, and external links are protected by the mighty power of math. This means kids are much less likely to leave the app accidentally. It’s worth noting that Brave Rooney and The Super-Sized Superheroes has won several awards since its debut in 2014. This includes being named as a 2014 Mom’s Choice Awards Honoree and the winner of a 2014 Children’s E-Book Awards (CEBA) award for best original characters app. Overall, Brave Rooney and The Super-Sized Superheroes is an amazing storybook app for iPhone and iPad that’s a must-have addition to any parent’s collection. You definitely can’t beat the price, and the fact that there are many other storybooks by the same author means kids will have plenty of other stories to enjoy once they’re finished with Brave Rooney and The Super-Sized Superheroes. Brave Rooney and The Super-Sized Superheroes requires iOS 5.1 or later and is compatible with iPhone, iPad, and iPod touch. This app is optimized for iPhone 5.